GOOD rains in the catchment area of the Omaruru River over the past three days saw a stream of water forming at Omaruru on Sunday morning. As much as 98 millimetres of rain were measured in the area of Mount Etjo and surrounding farms since Thursday. According to Bobby Griebel, a resident of Omaruru, the town received about 25 millimetres of rain over the past three days. Griebel said the weather still looks promising to the north and to the west and he even speculated that the Omaruru River might flow stronger if more rain falls in the catchment area. Good rains were also reported to north and north east of Omaruru where as much as 20 millimetres were measured on farms surrounding Outjo. The Kamanjab area also received some rain. To the south of Omaruru up to 15 millimetres were measured in towns like Usakos and Karibib. Some rain has also been reported at the coast. Henties Bay and Long Beach received some rain. In the Hardap region rain fell at Maltahohe and further north in the area of the Gamsberg. Most of the rain reported, however fell in and around the Namibian capital and to north and west of Okahandja towards Karibib and Omaruru. 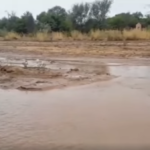 Residents of Windhoek reported that soft rain fell over night and in some places like Brakwater up to 30 millimetres were measured. In the city neighbourhoods anything between 12 and 20 millimetres were measured. Partly cloudy and warm conditions with isolated thunder showers are still forecast for the north eastern and south western parts of the country for the rest of Sunday. More thundershowers and scattered rain are forecast for the Kunene, Erongo and Hardap Regions while the Kavango and Zambezi regions can expect extremely hot weather conditions. Partly cloudy and warm to hot conditions with scattered rain showers are still forecast for the Namibian coast. Informanté Facebook invites readers to post their cloud or rain pictures along with measurements and location in the comments below.